In the iTunes app, select the iTunes Store. 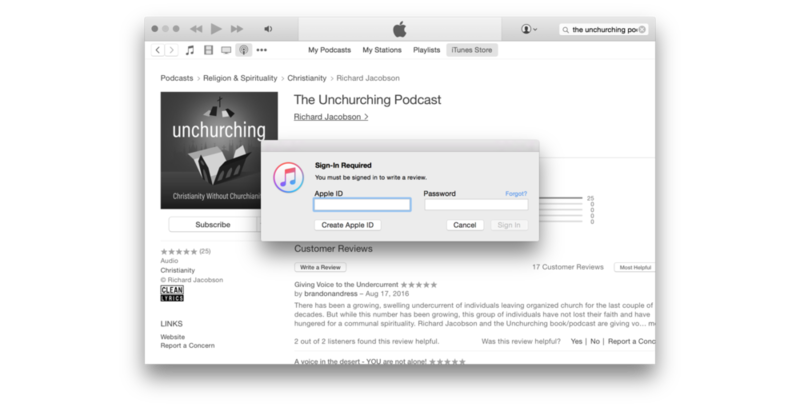 Type "Unchurching" into the search bar and select "The Unchurching Podcast". Click on the thumbnail of The Unchurching Podcast. Click on the "Ratings and Reviews" tab, then the "Write a Review" button. Sign-in with your Apple ID and leave a rating with a review! NOTE: If you don't have an existing Apple ID or can't remember your information, you should learn more about Apple ID's here first.